The Rhône Valley wine region in Southern France is situated in the Rhône river valley and produces numerous wines under various Appellation d’origine contrôlée (AOC) designations. The region’s major appellation in production volume is Côtes du Rhône AOC. 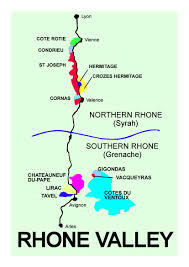 The length of the valley means that Rhone wines are the product of a wide variety of soil types and mesoclimates. The region’s wine-producing areas cover such a distance that there is a widely accepted division between its northern and southern parts. 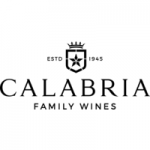 Rather neatly, they are separated by a gap of 25 miles (40 km) between the towns of Valance and Montelimar, in which almost no vines are grown. The appellation Cotes du Rhone Villages is restricted to specific villages whose terroir produces wine of a slightly higher quality. By chance, they are clustered in the southern section of the Rhone valley, around the town of Orange. An elected sub-set of about 20 (this list changes over time) are permitted to add their village names to the title Cotes du Rhone Villages, producing some interesting, long-winded names such as Cotes du Rhone Villages Saint-Maurice-sur-Eygues. One small but important area not covered by the obvious north/south divide is the Die district to the east of the Rhone. Located 30 miles (50km) east of Valence and Montelimar, the ancient town of Die sits at the foot of the French Alps. It produces sparkling wines under the appellations Clairette de Die and Cremant de Die, as well as some still whites under the Coteaux de Die title. Die is not alone in being the source of an idiosyncratic white Rhone wine. Condrieu wines from the north are rich, mostly dry whites with honeyed, floral aromas, while the sweet white wines of Muscat de Beaumes-de-Venise complete the Rhone’s wide repertoire of styles.